The new food court located within the Bay South Garden at Gardens by the Bay, is also just a steps away from Marina Barrage. 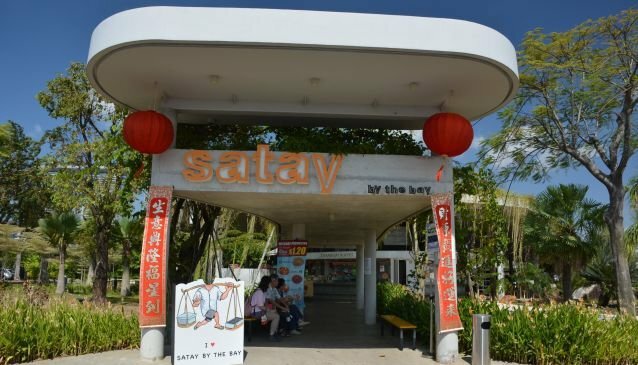 Satay by the Bay spreads over 2,000 square metres of floor space and can seat over 1,000 hungry visitors. Local Hawker-styled food is the main offering here with more than 20 food and drinks stalls to choose from. The eight satay-serving pushcarts are the main draw but you can also enjoy all the usual local food and some western favourites such as pizza and Middle Eastern dishes. And for a most westernised feel chill-out at the only Bistro Bar of the hawker centre serving liquor and some western food. Please note that all Drinks stalls are open 24 hours a day. A free shuttle bus (From 6pm - 11.45 pm Mondays to Fridays) is organised on weekdays at strategic pick-up points along the Beach Road, Suntec City Mall, Shenton Way, Marina Bay Financial Centre and Marina Bay Sands.